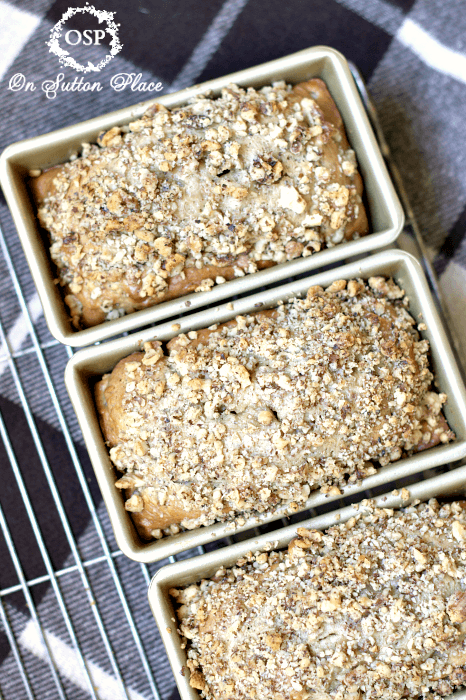 I am so happy I made it today…because I want to share what I would call one of the best quick breads ever. EVER. 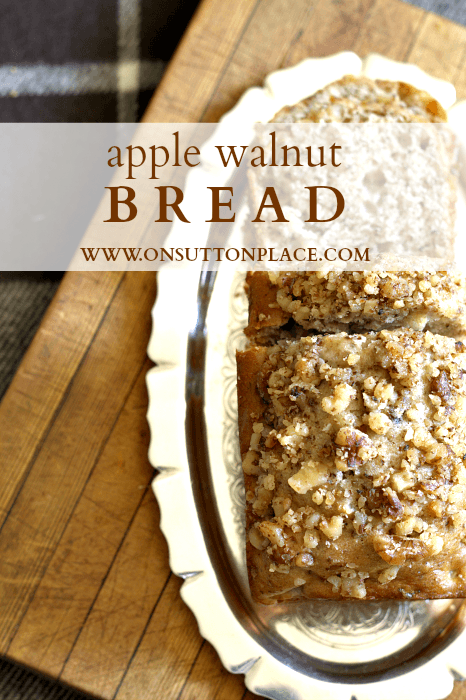 This Apple Walnut Bread is moist, has great texture and is comfort food at it’s best. I used Honeycrisp apples but before I made the bread I wasn’t sure it was the right choice. Picking the best apple for a particular dish can be tricky. I highly recommend Honeycrisp for pretty much any baked apple dessert. They are the perfect mix of tart and sweet. Prepare one large loaf pan or 3 small. Beat together first 4 ingredients. Add the dry ingredients mixing well and scraping sides of the bowl. Fold in the apples and half of the nuts. Pour batter into loaf pan(s) and top with remaining nuts. Let sit in pans for 10 minutes and then cool on a rack. My favorite loaf pans are from Williams-Sonoma. They are Goldtone mini bread pans. (I refer to them as small in the recipe.) I highly recommend any of the Goldtone products. When I started using them I was amazed at how much better everything came out. I will definitely be making this again probably around Thanksgiving. Would I do anything differently? Yep. I would make a double batch! 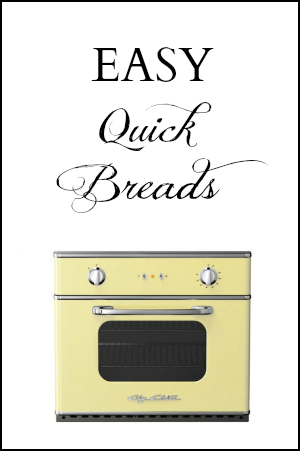 Click the image below for more quick bread recipes! I’ll be back in a day or so with new items just listed in my Etsy shop. I’ve switched up another wreath and cozied up my front porch for fall. I’ll share all that too. Have a perfectly lovely week! I should probably know this but when you say 1t is that tsp to tbs? I’m sorry! I was using the abbreviations but stopped because they were confusing. I thought I had all my recipes updated but must have missed this one. The “t” is a teaspoon and the “T” is a tablespoon. Thank you! This recipe sounds and look heavenly. Freshly picked apples await me, so I’ll go in search of Honeycrisp. I wonder if this recipe would freeze well? Would love for you to share your recipes on my Sunday’s Best linkup. Moms are always in search of great recipes. Yes the bread freezes beautifully! 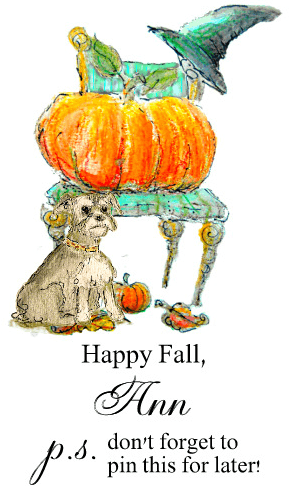 Ann, my youngest daughter away at College is coming home for Thanksgiving, she is requesting a day of baking with me….I am excited to make several of the recipes you have shared. You were right! This bread was fantastic! I thought it might be dry without butter or oil, but it wasn’t. I think it’s a nice treat for the waistline too! Thank you for sharing. Oh also I had a gift card for William and Sonamoa and I got a goldtone loaf pan and it’s great! Ann, I made your apple walnut bread today. It sounded so good when you blogged about it. I have had the ingredients for a while and today it felt so good to finally have the time to bake. I like this recipe and will make it again but my oven must cook a little too fast. Think I will lower the temp a little next time. My husband liked it also. Thanks for the inspiration. Is there supposed to be some type of fat in this recipe. I made them, but wondered about that and felt a bit of oil would be good to add. No Nanci…no fat unless you count the sour cream. You could add a little butter or oil. Let me know if you do and how it comes out! I feel the same way. Went out got the apples, had all the other ingred. It definetly needed some butter or oil. Will try to adjust for next time. I made this bread as well and it was too dry. It needs oil or butter. Was a little dissapointed. Might try again another time. I just bought some Honeycrisp apples ~ will definitely try this! I just bought a big pack of Honeycrisps at Costco…hmmmm…make have to bake this. If not today, then pinning for another day! Ann this is wonderful and would be perfect with a cup of tea right now. Hugs! Ann, this is a beautiful apple cake! YUMMY! I’m adding this to my recipe box! Ann…these are amazing. I can’t wait to make them. Do you have any of the other Goldtouch products? I love most all things WS…but was curious about their baking sheets. I need new better ones. And was looking at these. Pinning this and sharing. Thanks for sharing. The baking sheets are amazing. I have 2 of the big ones, like a jelly roll pan, and 2 smaller ones. I will never use anything else! Will try it for a luncheon this week, looks lovely. Do you use the spray or brush on shortening to prepare your pans? I bought the same pans but haven’t made any breads lately, will try this recipe. I use the spray. It’s called Baker’s Joy and has a blue top. I use it for everything. Breads, cakes, etc. I have never had anything stick! Ann, years ago my mother-in-law bought apple-walnut bread from Trader Joe’s in southern California. For years both my husband and I have looked in every TJ we have been near looking for this bread. I am really, really pumped that you posted this recipe. Can’t wait to try it. And it is great toasted. You make the best breads. Thank you so much. Oh my gosh toasted would be awesome! Let me know if you make it and how it comes out…thanks for stopping by! I have the ingredients to make this…I just need to do it. Ever since you’ve posted this recipe, I’ve been dying to try it with a cup of coffee. Thanks for the tip on the goldtone pans! Looks and sounds yummy Ann! !